Homo erectus to Modern Man: Evolution or Human Variability? Originally published in Journal of Creation 8, no 1 (April 1994): 105-116. An interesting change is taking place in creationist circles in respect of the status of the taxon Homo erectus and its relationship to Homo sapiens sapiens. This development is paralleled by a similar change of direction in evolutionary thinking, and in both cases it seems likely that the impetus is being largely propelled by the discovery of the erectus specimen KNM - WT 15000 in Africa in 1984. This attitudinal shift has connotations for the whole topic of alleged evolution of human beings. In this brief paper it is proposed to track these amended attitudes and the implications for the creation-evolution controversy. With the discovery of Java and Peking Homo erectus fossils (the former was previously called Pithecanthropus erectus, and Peking Man was originally named Sinanthropus pekinensis), in 1891-1893 and 1927-1937 respectively, evolutionary theory received a considerable and much-needed boost. Until Dubois” Java discoveries, the only alleged link between man and the apes had been a few Neanderthal specimens. The Piltdown hoax of 1912- 1914 was not uncovered until 1953, by which time it had played a considerable part in the early skepticism by most authorities toward the Taung-child australopithecine discovery in South Africa in 1924. With the appearance of the Javan and Peking fossils it seemed that evolutionary theory had been vindicated to a sizeable degree, and Pithecanthropus (ape-man) became a common term in public as well as in palaeoanthropological circles. The australopithecines came into favour as a transitional form linking an ape-like common-ancestor to human beings. After the Piltdown fraud was exposed, the australopithecines came into favour as a transitional form linking an ape-like common-ancestor to human beings, and this link was further strengthened by later finds of both erectus and australopithecine fossils, mainly in East and South. Africa. By the early 1970s, more finds including australopithecus-like material classified as Homo habilis, made it appear that there was now a fairly substantial chain of progressive evolution from a bipedal chimp-like ancestor right through to modern man - A. afarensis, H. habilis, H. erectus, archaic H. sapiens, Neanderthal man and finally Cro-Magnon or modern man. With the rise of the post-World War II creationist movement, largely sparked by the epic work of Whitcomb and Morris in 1961,1 one of the most urgent tasks involved was how to respond to this apparent chain of evolutionary progression. In the intervening years since then, creation-oriented scientists have made a number of attacks on the validity of most of these forms, some of them being of high technical quality, others a little less well-informed. The central feature of this paper mostly involves the so-called erectus section of the chain, where a quite noticeable change of direction is well underway, both in the creationist and the evolutionist camps. Far from dismissing erectus forms as being only large extinct apes or frauds, the pendulum is now swinging to the view that most, if not all erectus specimens are indeed full members of the human race. With the discovery of the Turkana “Boy” WT 15000 in 1984 in Kenya, it is no longer possible to hold to the position that Homo erectus was only a large-brained pongid. In evolutionary circles it is becoming increasingly common to argue that although H. erectus forms are still on the “road” from ape to human, the morphological distinctions between all human-type forms are insufficient to justify a separate species classification for erectus - that is, that all post-habiline forms (erectus, archaic and modern sapiens plus the Neanderthals), could be subsumed into a single species -H. sapiens, with a subspecific distinction at most. (The times and ages mentioned here are those commonly used in evolutionary scientific literature and are used for ease of identification only. I do not accept an earth history of millions of years. 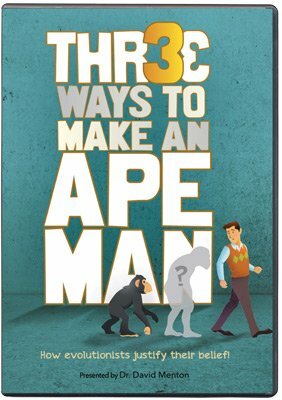 Homo Erectus -Man, Ape, or Ape-man? Figure 2. Skull-cap profile of Java Man found by DuBois in 1891 - 1893. Note the general similarity to Peking Man of Figure 1. However, with the Leakey/Walker 1984 find of the above specimen, it became clear that there was more to Homo erectus than Java and Peking Man. WT 15000 consists of almost a complete skeleton (see Figure 3).16 Only the hands and feet are missing. Figure 3. Skeleton of the Turkana “Boy” - WT 15000, a Homo erectus specimen dating from 1.6 mya. This skeleton is fully human with only very minor differences from some modern humans. The resemblances between WT 15000 and the two controversial Asian erectus forms are clear and decisive. The Turkana Boy possessed the same heavy supraorbital ridges, the same type of receding forehead, and other cranial features as Java and Peking. With an estimated age of about 11 years old at death, and a cranial capacity (EndoCranial Volume) of about 900cc, WT 15000 is plainly a human being - even in the post-cranial features. Radiodated at about 1.6 mya (million years ago), this lad stood and walked as fully erect as do humans today.17,18 Although the brain capacity is rather small, it is still larger than some juvenile and adult humans of today. At a height of five feet four inches or 1.6 metres, it is likely that WT 15000 was getting close to full adult height at the time of his death - this could have been anywhere between five feet five inches to maybe six feet; there is no possible way to establish final height with certainty, although a figure closer to six feet is more probable. In my high school days, I had a friend of age 15 who was short - around five feet two inches, yet by age 19 he had mushroomed to six feet. At the same age, another of my school friends was about five feet five inches yet in adulthood he had gained only another two inches. One cannot always successfully extrapolate in these matters. In all vital respects WT 15000 was as human as you or I. Figure 4. Skull profile of erectus specimen KNM-ER 3733. This fossil human is of similar geological age to WT 15000. The finding of ER 3733 and WT 15000 therefore appears to strongly reinforce the validity of Java and Peking Man. The clear similarities shared by all four (where skeletal and cranial material is available), render untenable any claims that the two Asian specimens are nothing more than exceptionally large apes. Further, their affinities with both archaic sapiens and Neanderthal sapiens are so strong that it can hardly be denied that all are closely related human beings. The question of course is - are erectus forms proof of an evolutionary progression from the apes, or are they simply temporal, regional, climatic, dietary or pathological variants of human beings? According to Molnar, the modern human range runs from about 700cc to 2200cc,27 and this puts every adult erectus specimen comfortably into the range of modern humans, and this range also covers every adult example of archaic sapiens, Neanderthal, and Cro-Magnon Man. Writing in 1985, Pellegrino conceded that the differences between H. erectus and modern man are merely superficial.28 On the same page he even discusses the probability that H. erectus and H. sapiens are one and the same species. Now obviously if the distinctions between erectus and modern humans are merely superficial as Pellegrino admitted, then the differences between the earliest and the latest erectus specimens, and between erectus and archaic and Neanderthal sapiens are even more superficial; that is, there is a great probability that all erectus, Neanderthal and H. sapiens are closely related, with genetic, dietary, climatic, and other environmental diversity in evidence. As Beasley29 and Lubenow30 have recently published excellent papers on the question of the archaic H. sapiens, it is not my intention to go into that question in any great detail. In actual fact, there are some examples of erectus which display quite a large ECV, such as Vertesszöllos.33 To make matters even more interesting, there are human skulls in Australia, dated as modern, which exhibit clear and unambiguous erectus features. Found in Victoria (Kow Swamp), and New South Wales (Willandra Lakes, Mungo), several of these Australian aboriginal remains have fully modern human-sized brains of around 1250cc, yet they all possess the heavy supraorbital tori, flattish receding foreheads, prognathic faces, and large jaws so typical of the earliest and the latest erectus specimens. Figure 5. Outline of a Kow Swamp skull dating from very recent time - less than 15,000 years ago. The affinities with very early erectus specimens are obvious - only in brain capacity is there any significant distinction. Because of the alleged time factor, all these erectus - like individuals are obviously classified as Homo sapiens. Lubenow lists 16 erectus characteristics, and almost all, including brain size, are found in the above individuals. As he says, ' … ( erectus ) is truly a man for all seasons.“45 If these fossils dated from say 300kya, they would undoubtedly be assigned to the taxon Homo erectus. On the other hand, if creationists are right in believing that earth has only a short history (measured in millennia, rather than millions of years), then there would be no argument - all forms of Homo (except the phantom-like H. habilis), would form just a single contemporary species. The growing creationist (and evolutionist) view is gathering strength - that H. erectus and all H. sapiens forms should be considered not as separate species but as a single human species encompassing a range of genetic and phenotypic diversity. In the creationist view there was no evolution from the apes,46-48 nor was there any phylogenetic, “ascent” from an inferior type of human to a more advanced type. Also, Custance has argued convincingly that the so-called “primitive” erectus and Neanderthal features are almost entirely due to the functioning of the jaw mechanism which would affect the size and shape of brow ridges, the forehead and the zygomatic arch.51 On page 183 Custance finds that the “primitive” facial and skull features have nothing to do with evolution, but are due to the eating of uncooked or partially-cooked foods, especially in childhood, thus strengthening the jaw mechanism, causing it to be- come more massive in structure, and this process deforms the skull by depressing the forehead, making the brow ridges more prominent, and forces outwards the zygomatic arch, thus accentuating the cheek bones. If these people also chewed hides and skins of animals for softening, this would also have had a similar effect. This effect is increased by the tugging of flesh from the bones, and might be particularly pronounced when the diet, especially of juveniles, is lacking in bone-hardening substances such as calcium. By mid-adolescence these features then would become “set in concrete” as adult characters. Custance cites known examples, and points out that such authorities as Hooten, Howells, Hrdlicka and others were well aware of this.52 Thus, such a process, occurring in individuals, could well account for many erectus and Neanderthal features. Custance’s works should be compulsory reading for all anthropologists, whether creationist or evolutionist. The fact that these forms arose well before the first Neanderthals, although many of them were allegedly more “progressive” than these, is a widely-debated problem, as is the fact that the more “progressive” Neanderthals with a steeper forehead appear in the evolutionary fossil record before the classic or more “primitive” European Neanderthal forms, thus indicating that the former did not evolve from the latter as the morphology might otherwise suggest. The patterns differ according to continent. The earliest archaic sapiens appear in Europe (Germany and Greece) around 600-700kya (Petralona and Mauer, Heidelberg), around 350kya in France (Arago 21) and Germany (Steinheim). The earliest African archaic forms are Ndutu, Tanzania (at 450 kya) and Saldanha, South Africa (at about 300kya). The Swanscombe female archaic skull from England dates from about 300 kya. All of these bear erectus-type as well as more modern-type cranial features. Bunney reported in 1986 that a human skeleton dating from c.280kya in China antedates an erectus skull from Zhoukoudian (the Peking Man site) near Beijing by 50,000 years. The earlier skull is typical erectus in its morphology, yet has a rounded occiput and a brain case of about 1390cc. Authorities are thus in a fix -the date says H. erectus, but the brain size is modern Homo sapiens.58 The Vertesszöllos erectus from Hungary is a very similar case. He considers that by “making up” this category called “archaic sapiens“, evolutionists wish to portray them as transitionals between erectus and Neanderthals and modern man. It is not my belief that they intend to deceive at all; this taxon could be said to represent a convenient classification for the purposes of discussion and reference, even though the overall differences are so slight. These specimens do certainly pose problems for evolutionary theory but the mix of modern and erectus characters is real enough. The main conundrum appears to be how and why so many advanced or derived characters are present so long before either Neanderthals or modern humans appear in the fossil record, and Lubenow is correct in attacking the picture by referring to the dates.60 Also, why should Neanderthal forms of less than 100,000 years ago display so many “primitive” features if it was merely a matter of straight- forward progression from erectus to archaics and Neanderthal? A skull from Tabun is classic Neanderthal, yet in nearby Skhül a number of skulls are intermediate between classic Neanderthals and modern humans. According to Waechter, the Skhül population may be the hybrids of Neanderthals and true modern sapiens who were already in existence.64 A gracile Qafzeh skull is quite modern with a high forehead and short braincase, whereas a Tabun skull nearby is classic Neanderthal with occipital bun; yet both had the brain capacity of fully modern humans.65 (See Figure 7. )66 While these questions pose problems for strict evolutionary progression, much of the difficulty lies in the assumption of evolution in the first place. Figure 7. Human specimens from Qafza (left) and Tabun. These examples lived contemporaneously less than 100kya, yet the robust Tabun skull (right) features typical Neanderthal characters such as the occipital “bun’. Both had brains as large as those of people alive today. Bromage points out that the first reconstruction of ER 1470 was erroneous by giving it a flat face, but - “… recent studies of anatomical relationships show that in life the face must have jutted out considerably, creating an ape-like aspect, rather like the faces of Australopithecus“.72 This finding is one of a number which suggest that the species Homo habilis never existed. In reality all “habiline” forms display unmistakable australopithecine traits. Lubenow’s discussion of the australopithecine, habiline, erectus and Neanderthal specimens is an excellent exposition of the creationist view that the first are extinct chimp- or gorilla-like forms, and the “habilines” are nothing more than variants of australopithecines, while erectus/Neanderthal/modern man are simply varieties of a single human species. The question of the archaic sapiens from a creationist viewpoint has been dealt with superbly by Beasley,77 who offers a cogent, reasonable and well-researched case that the archaic sapiens are our post-Flood ancestors with variable morphological features due to such influences as prolongation of skeletal maturation and greater longevity potential; environmental; and dietary/pathological pressures within a post-Deluge framework. Beasley’s paper is a land- mark in creationist research on this subject, and every Christian should possess a copy with which to question materialist-minded educators. If so, then H. sapiens is either polyphyletic (three independent lineages), or evolved gradually on a broad geographical front between 400-200kya. The implication is clear- “… that H. sapiens and H. erectus are one and the same species which is changing gradually through time.” (Emphasis added. )81 I agree that they are one and the same species -exhibiting variability in the early centuries after the Flood. On page 25 Andrews also discusses the possibility that Homo sapiens evolved only once in Africa and spread into Europe twice, once giving rise to the Neanderthals, and later via Skühl and Qafzeh populations, to Homo sapiens in Europe. Yet on the same page he says- ‘ … it has been demonstrated that the European hominid sequence could be viewed as a single lineage… culminating in the classic Neanderthals of the last ice age.” (Emphasis added). To the informed creationist, most of this is meaningless and irrelevant. The morphological differences within all erectus specimens and between erectus, Neanderthal, and all Homo sapiens are so small that there is not the slightest reason to doubt that every form should be classified in a single human species, as we have already seen advocated. It is not generally known to the lay-person that there are a number of modern humans who display the same erectus/Neanderthal features in addition to the Kow Swamp and Cossack examples. Taylor has published a photo of an Indian woman who clearly exhibits very large supraorbital tori.82 On the next page he gives another example of a living human who was closely examined in the Philippines in 1908. The man had massive brow ridges, a poorly defined chin, and a large lower jaw. I personally have seen and conversed with two East European immigrants where very large brow ridges and a flattened forehead were clearly visible, yet both, who incidentally were squat and heavily built, were normal individuals. The human skull is very plastic in early childhood and I believe Custance’s theory of dietary/climatic effects may account for some erectus/Neanderthal features very well, while racial/genetic variability is also to be considered. Evolution from animal ancestors is not involved. It used to be popular years ago to stress the distinctions between Neanderthal Mousterian tools and those of early modern man, but Wood83 admits that recent evidence indicates that these differences are not at all clear cut. Mousterian tools are found with modem skulls at Jebel Irhoud and it is therefore misleading to associate Mousterian tools solely with Neanderthal Man.84 It is also clear that not all erectus/Neanderthal specimens possessed all of these so-called primitive features, such as the Teshik- Tash 10-year-old and the Krapina “A” juvenile. These were both youngsters but the 18 year-old youth Ehringsdorf “F” fossil possessed both a steep forehead and a fairly high cranial vault, a moderate torus and thinner bones.85 Two Neanderthal mandibles, Ehringsdorf “F” and “G’, an adult and a juvenile, had well -developed chins.86 In view of these by-no-means-rare cases, any evolutionary “progression” simply does not fit the bill. In a previous article101 I demonstrated the lack of suitable primitive ancestors for the australopithecines, for “habilis” and for Homo erectus. In this paper I hope to have shown that the erectus-archaic-Neanderthal-modern man “chain” is non-evolutionary; that is, that all these forms are simply varieties of human beings (see Figure 8).102 The question of time is irrelevant - it makes no difference whether the time involved is millions of years or only a few thousand. The morphological distinctions are very much insufficient to warrant placing these forms in separate categories which only serves the purpose of evolution - a theory to which so many scientists are committed as dogma. Once evolution is accepted as dogma, all evidence is interpreted in a subjective, rather than objective, manner. Creationists will continue to expose the weaknesses in the theory and to encourage further research and study into the origins of man. It is not simply a matter of blind adherence to religion; the evidence is available to all who honestly wish to study and evaluate it. Figure 8. Skull outline of a “progressive” Neanderthal. Authorities find it paradoxical that the more “primitive” or classic forms appear in the fossil record before the more modern, “progressive” types such as above. The actual facts of the fossil record, that is the fossil materials themselves as against evolutionary interpretations of these materials, show indisputably that contrary to expectation the “earliest” erectus skeleton (WT 15000 or the Turkana “Boy’) proves by its very existence that this human being was large like modern humans, and not small and ape-like. On the other hand fossil OH 62 proves that “habilis“, far from being Homo-like, was small and ape-like - these cases were the very opposite of what evolution theory predicted and expected.103 Even though the brain size of WT 15000 was smaller than most modern humans, it was still larger than quite a few people living today. As for time and geology, all known facts are subject to somebody’s interpretation. Some are reasonable, others are not. It is reasonable for example to interpret an inferior rock layer as having been deposited earlier in time than the layer above, but when it comes to the question of how much earlier all estimates must necessarily be based on a number of assumptions, and this also applies to all radiometric and geological dating methods. The estimates made may be correct, partially correct, or totally wrong, and therefore almost all of geology, time and fossils are exposed to subjectivity, no matter how carefully the experts tackle their tasks. Once evolution is accepted as dogma all evidence is interpreted in that light. Lay-persons reading popular science books, magazines or newspaper articles will assume that the picture of human evolution presented therein is a depiction of established fact. This view is totally erroneous - the scientists have a scanty, but in places reasonable, selection of past life-forms - 50 or 60 pages of a book of unknown length, and if (as usual) they are already believers in evolution, these representatives of past life will inevitably always be interpreted in the light of the theory. Other alternatives such as presented here and in various creationist works are equally valid, but it is emphasized that neither creation nor evolution can be scientifically proven. After careful study of hundreds of scientific descriptions, and photographs of scores of fossil humans, it is clear to me that all shades of intergrading exist between “ancient” erectus and modern humans, but the chronological patterns of appearance, even using the evolutionists” own dating methods, do not match the predictions of the theory. In view of the clear-cut and unmistakeable morphological gap between apes and humans, I believe that human fossil study provides strong circumstantial evidence in favour of the theistic view of origins as outlined in the early chapters of the book of Genesis, as against the current view that random or chance genetic accidents were responsible. The drawings on which the figures are based were prepared by my son Gary Mehlert. Whitcomb, J. and Morris, H., 1961. The Genesis Flood, Baker Book House, Grand Rapids, Michigan. Mehlert, A W., 1992. A review of the present status of some alleged early hominids. CEN Tech. J., 6(1):10-41. Gish, D. T., 1985. Evolution: The Challenge of the Fossil Record, Creation-Life Publishers, El Cajon, California, pp. 140-180. Lubenow, M.,1992. Bones of Contention, Baker Book House, Grand Rapids, Michigan, pp. 50-57, 157-168, 172-179. Beasley, G. J., 1990. Pre-Flood giantism: a key to the interpretation of fossil hominids and hominoids. EN Tech. J., 4:5-55. Lubenow, Ref. 4, p. 127. Cberfas, J. and Gribbin, J., 1981. Descent of man or ascent of ape? New Scientist, 91(1269):594-595. Gish, Ref. 3, pp. 180-203. Bowden, M., 1977. Ape-Man: Fact or Fallacy? Sovereign Publications, Bromley, Kent, pp. 78-148. Johnson, W., 1982. The Crumbling Theory of Evolution, Queensland Binding Service, Brisbane, pp 40-45. Lubenow, Ref. 4, p. 135. Lubenow, Ref. 4, p. 91. Fezer, K. D., 1993. Creation’s incredible witness: Duane T. Gish, Ph.D. Creation/Evolution, 33:5-21 (p. 12). Lubenow, Ref. 4, p. 86. Brace, C. L. and Montagu, A., 1977. Human Evolution, Second Edition, Chicago University Press, pp. 204-205. Leakey, R. and Walker, A., 1985. Homo erectus unearthed. National Geographic, 168(5):624-629. Leakey, R. and Lewin, R., 1992. Origins Reconsidered, Abacus Books, London, pp. 58-64. Leakey and Walker, Ref. 16, pp. 624-629. Jue, D. S., 1990. Cranial capacity and endocranial casts. EN Tech. J., 4:56-65. Broderick, A H.,1971. Man and His Ancestors, Hutchinson and Co., London, p. 84. Lubenow, Ref. 4, pp. 123, 128. Beasley, G. J., 1992. Pre-Flood giantism: a key to the interpretation of fossil hominids and hominoids. Unpublished manuscript (original Version), p. 71. Beasley, Ref. 22, p. 71. Lubenow, Ref. 4, p. 138. Jue, Ref. 19, p. 57. Molnar, S., 1975. Races, Types and Ethnic Groups, Prentice-Hall, Englewood Cliffs, New Jersey, p. 57. Pellegrino, C. R., 1985. Time-Gate, Hurtling Backward Through Time, TAB Books, Blue Ridge Summit, Pennsylvania, p. 120. Beasley, G. I., 1992. A possible creationist explanation of archaic fossil human remains. CEN Tech. J., 6(2):138-167. Lubenow, Ref. 4, pp. 78-85. Lubenow, Ref. 4, pp. 29-30. Pellegrino, Ref. 28, p. 124. Campbell, B. G., 1988. Humankind Emerging, Fifth Edition, Time-Life Books, Harper ColIim, New York. pp. 287-288. Attwood, A., and Edwards, K., 1987. Footprints of early man. Time Australia, 2(13):28-41 (supplementary map). Attwood and Edwards, Ref. 34, p. 37. Wolpoff, M. and Thorne, A., 1991. The Case against Eve. New Scientist, 130(1774):35. Groves, C. and Thorne, A., 1991. Brawl about Eve. The Australian Magazine, February 16-17, p. 28. Stringer, C., 1990. The emergence of modern humans. Scientific American, 263(6):74. Wood, B., 1976. The Evolution of Early Man, Cassell Australia, Sydney, pp. 98-100. Flood, J., 1990. The Riches of Ancient Australia, University of Queensland Press, Brisbane, p. 20. Lubenow, Ref. 4, p. 133. Attwood and Edwards, Ref. 34, pp. 37-39. Lubenow, Ref. 4, pp. 131-132. Lubenow, Ref. 4, pp. 132-133. Mehlert, Ref. 2, pp. 33-38. Lubenow, Ref. 4, pp. 134-143. Beasley, Ref. 5, pp. 31-55. Lubenow, Ref. 4, pp. 149-156. Beasley, Ref. 5, pp. 5-55. Custance A., 1975. Genesis and early man. The Doorway Papers, Volume II. Zondervan, Grand Rapids, Michigan, pp. 183-184, 208- 211. Custance, Ref. 51, p. 184. Campbell, Ref. 33, pp. 200-201. Gibbons, A., 1992. An about-face for modem human origim. Science, 256:1521. Shipman, P., 1993. On the origin of races. New Scientist, 137(1856):36. Tianyuan, L., and Etler, D.A., 1992. New Middle Pleistocene hominid crania from Yunxian in China. Nature,357:404-407. Bunney, S., 1986. Chinese fossil could alter the course of evolution in China. New Scientist, 111(1520):25. Lubenow, Ref. 4, p. 80. Waechter, J., 1976. Man Before History, Elsevier International Publishing Co., Oxford, p. 64. Richards, M., 1993. Caveman shows his face. The Courier Mail, Brisbane, November 8, p. 9. Dorozynski, A., 1993. Possible neandertal ancestor found. Science, 262:991. Waechter, Ref. 61, p. 63. Bar-Yosef, O. and Vandermeersch, B., 1992. Modem humans in the Levant. Scientific American, 268(4):68. Bar-Yosef and Vandermeersch, Ref. 65, p. 68. Bromage, T., 1992. Faces from the past. New Scientist, 133(1803):32- 35. Hummer, C. C., 1977. A plea for caution about skull1470. Creation Research Society Quarterly, 14(3):171. Leakey and Lewin, Ref. 17, pp. 193-194. Cherfas, J.,1983. Trees have made man upright. New Scientist, 97:172- 178. Bromage, Ref. 67, p. 35. Campbell, Ref. 33, pp. 378-379. Lubenow, Ref. 4, pp. 61-64, 76-77. Lubenow, Ref. 4, p. 73-74. Custance, Ref. 51, pp. 183-184, 208-211. Beasley, Ref. 29, pp. 138-167. Rensberger, B., 1981. Facing the past. Science “81,2(9):41-50. Andrews, P., 1984. The descent of man. New Scientist, 102:24-25. Wood, Ref. 39, p. 99. Andrews, Ref. 79, pp. 24-25. Taylor, I.,1987. In the Minds of Men, IFE Publishing Co., Toronto, p.214. Wood, Ref. 39, p. 108. 84. Wood, Ref. 39, p. 108. Beasley, Ref. 29, pp. 144-145. Beasley, Ref. 29, p. 145. Beasley, Ref. 29, p. 143. Beasley, Ref. 29, p. 163. Shipman, Ref. 56, p. 34. Wolpoff and Thome, Ref. 36, pp. 33-37. Shipman, Ref. 56, p. 36. Reader, J., 1990. Missing Links, Penguin Books, London, p. 189. Shipman, Ref. 56, pp. 36-37. Maslen, G., 1990. Man or ape? The Sunday Mail, Brisbane, May 20, p.11. Wieland, C., 1992. No bones about Eve. Creation Ex Nihilo, 13(4):20-23. Beasley, G. J., 1992. Is the African “Eve” misconceived? CEN-Tech. J.,6(1):42-48. Denton, M., 1985. Evolution: A Theory in Crisis, Adler and Adler, Bethesda, Maryland, pp. 233-307. Wieland, C., 1993. Personal communication. Mehlert, Ref. 2, pp. 10-41. Campbell, Ref. 33, p. 388. Reader, Ref. 93, pp. 188-189. Woodmorappe, J.,1983. A diluviological treatise on the stratigraphic separation of fossils. Creation Research Society Quarterly, 20(3):133-185. Whitcomb and Morris, Ref. 1.